The Northwest Is Cutting Edge! We may be Sleepless, but we’re a pretty proud bunch of innovators! Seattle home of… grunge music, the new-era of coffee and some rather larger machinery that flies. 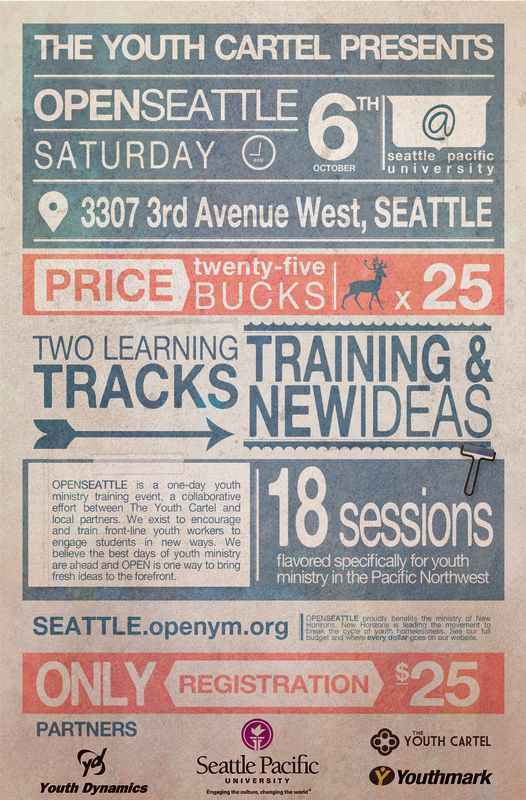 Well, we’ve been selected as the launching point of another pilot, Open Seattle. If you are involved in the Student Ministry Field (volunteer, paid, parent of teen, etc. ), this is a one-day (Saturday) event worth checking out. In addition to it being innovative in its approach, it is EXTREMELY affordable, just $25! An event like this typically would cost a lot more, but none of the speakers is getting paid– we’re doing it because we believe it is something that is needed in Youth Ministry RIGHT NOW (collaborating with others and mutually training one another)! Come join us, Saturday, October 6! Youth Pastors/Directors: Bring a few (or all) of your volunteer team! Youth Leaders: Bring the ideas you’ve been afraid to share in the past, here you’ll have an audience who WANTS/NEEDS to hear them! Parents: Come partner with a tribe of youth leaders who so desperately need teammates! The next stops for Open are Boston and Paris… that’s right, we’re first, AGAIN! P.S. I’d love to have you join me at my session, “The Virtuous Cycle”… We’ve seen the “vicious cycle” (one bad thing leading to other bad stuff, etc. ), I’ll be inviting us to see the cycle of redemption that can exist where we lead with training students to live and share openly about their faith. A virtuous cycle of (warning: Big Theological Terms Coming) Evangelism and Edification! ← Super Exciting BIG Youthmark Announcement! So thankful for your friendship and partnership on this. Yes, yes, and yes. I can’t wait for Seattle!